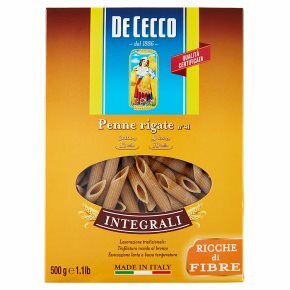 De Cecco's is the first wholemeal pasta certified for the distinctive quality of important parameters such as: The selection of best durum wheat, which guarantees a greater firmness of the pasta whilst cooking; Use of high particle size to preserve the wholeness of the gluten; Kneaded with cold water (under 15°C), that assures a sweeter taste and a better firmness during cooking; Coarse bronze drawing, to give pasta the ideal roughness that makes it adhere perfectly to sauces. Fibre is an important part of a well balanced diet, and it contributes to daily wellbeing as it is extremely healthy for the body. De Cecco Whole wheat pasta is made according to the traditional processing rules. From the simple milling of the best durum wheat, which in our Mill becomes valuable coarse-grain whole wheat semolina, mixed exclusively withpure water from the De Cecco spring, to the drawing through bronze dies to obtain a rough surface, and lastly to the slow drying at low temperatures to give you a product with a genuine taste that is naturally rich in fibre.